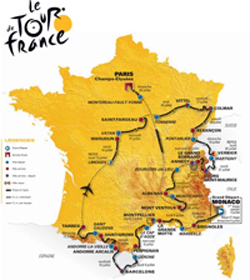 The 96th Tour de France will be running from Saturday 4th July to Sunday 26th July: 21 stages, 3,500 kilometres, 6 countries, this year the race is going to be impressive. Brace yourselves - as always you're in for a ride: excitement and suspense till the very end. 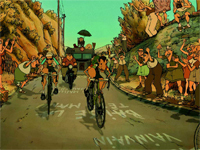 Everybody who has seen Sylvain Chomet’s masterpiece “Belleville Rendez-vous” is familiar with the French obsession with the Tour de France. Cycling is a sport which has experienced a dramatic increase in the number of participants and this is particularly true in the UK. Let's not forget how well the Brits did at the last Olympics! This July, the French will not be the only ones to be glued to their TV sets. The French are people who do not do half-hearted passion: their passion is so strong that protests explode every year when the route is announced: Every single town in France wants to be honoured by being on the path of the Yellow Jersey! Well, choices have to be made and the 2009 edition mainly focuses on South East France. Bad luck Bretons! Now, are you well and truly versed in the rules of the race? - Yellow Jersey stands for the general time classification. - Green Jersey for the points classification. At the end of each stage, points are earned by the riders who finish first, second, etc. Points are higher for flat stages, as sprints are more likely, and less for mountain stages, where climbers usually win. - White and Red Polka-Dotted jersey is the mark for the best climber. - White Jersey awards the best young rider of the race (he should be no more than 25 years old in the year of the race). And what about this year? Have a look at the map! This year the Tour will start in Monaco and will successively, stop off in France, Spain, Andorra and Switzerland and make a detour into Italy: a total of 6 countries visited. It is almost a record but in 1992, the Yellow Jersey passed through 7 countries. The Tour de France takes place in South East France and the stages on the Mediterranean coast promise to be intense because of the heat and the wind! The route will not be easy! - 10 flat stages. These types of stages make it difficult for small groups or individual cyclists to break away from the pack. Most of the time, it ends up with all the competitors approaching the finish line neck and neck. - 7 mountain stages. On the other hand, they often cause big "splits" in the finishing times and are therefore crucial. - 3 summit finishes. These are mountain stages which end up at the top of a mountain. They are especially physical and gruelling but this is not the time to let up since this is an opportunity for climbers to widen the gap… These stages are always worth watching! - 2 individual time-trial stages. In an individual time trial, each rider rides individually against the clock. - 1 team time-trial stage. The team time-trial has not appeared on the race programme since 2005 but is now back on the programme! Never in the history of the event has a mountain been on the programme the day before the finish in Paris. And this is not an easy mountain to climb: the Mont Ventoux is a legend of the Tour de France, considered as one of the most gruelling climbs of the race… How spectacular it would be if this stage were the decisive one! 20 teams will be cycling for this 96th edition and let’s hope they are all going to finish. Last year, a Spanish team was expelled as rider Riccardo Ricco tested positive during doping controls. Sadly, once again, drug-taking and cycling cannot be totally dissociated. This year, the Belgian Tom Booneen has already been excluded from his team and from the race because he tested positive for cocaine. Will it be the only case? Can anything else be expected in a sport which asks its participants to go beyond their limits? If you want to have the results and news from the 2009 Tour de France, including daily updates from race, go to the FranceInLondon article. It was iindeed a fantastic event and an eye-opener for many people including ourselves. We stayed to watch Mark sprint to the finish line, absolutely incredible! Here are some pictures of the moment you saw Rudolph Walker. We had lunch with him after the race and what a great man, the amount of charities and fundraisers he gets involved with is very inspiring.